Your insurance need will change as your life does, from starting to work to enjoying your golden years and all the stages in between. Each one of these stages may pose a different insurance need/cover for you. 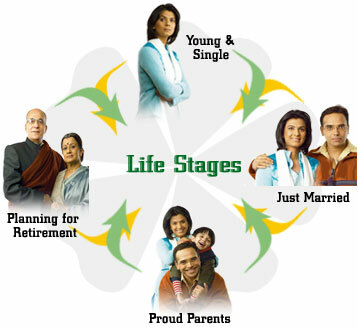 In this section, we have drawn up the basic life stages and help you analyse various insurance needs accordingly. Please click here to get in touch with our financial consultant to know more about our products. An important stage where one lays down the foundation of a successful life ahead. Take advantage of the time and power of compounding to ensure that you build up your dreams. Start saving early. Marriage brings about a significant change. New dreams and new opportunities also bring in additional responsibilities. While both of you look forward to a happy and secure life , it is equally important to ensure that eventualities don’t come in the way of shaping your dreams. Once you have children, your need for life insurance is even more. You need to protect your family from an untoward incident. Ensure your protection umbrella takes into account the future cost of securing your child’s dream. You will want life to go on for your loved ones, and having enough life insurance is a way to help ensure that. While you are busy climbing the ladder of success today, it is important for you to take time and plan for your life after retirement. Having an early start for retirement planning can make a significant difference to your savings.Think about your golden years even before you have reached them. The key is to think ahead and plan well using your time and money.